When I first found out we were pregnant, I researched all of the best books for moms-to-be. And then, in all honesty, I felt a little overwhelmed. So I stopped Googling, and instead, ordered just one book – Yeah Baby! by Jillian Michaels. As some of you may recall, I have a bit of a love/dislike relationship with Jillian. I love her workouts and her overall approach to fitness, but I often find myself getting annoyed by her personal stories. They come off a bit privileged to me. With that being said, when I first heard about this book while listening to her podcast, I almost dismissed it. However, the information shared definitely drew me in and prompted me to read a few reviews. So at about eight weeks pregnant, I ordered Yeah Baby!. I have to start off by sharing that I actually love this book. For many reasons. Of course, there are a few things that didn’t really resonate, but those were truly far and few between. The tone in which it’s written. It’s very Jillian, which in this case, I actually like. You feel like you’re chatting with an old friend about all things pregnancy. And from what I hear, this is something that sets this book apart from some of the older books out there. The content is research based and supported by a team of five experts from various health/wellness fields. The book is broken down by trimester (makes total sense), and at the end of each section, Jillian provides a customized workout plan. I intended to try her workouts, but then found some great YouTube channels and kind of forgot about this part of the book. But after taking a deeper look at what Jillian proposes, I can definitely see her plan being effective. She includes a chapter on the “Fourth Trimester,” which I love since not too many people talk about it. From what I understand, there’s a [huge] adjustment period after the baby comes, and I feel like the information she shares is practical and well-founded. Each chapter/section goes into a lot of depth without being too technical or even scary. The information is easy to understand, current, and fun to read. And everything is focused on baby and mommy’s health…no hidden agenda. 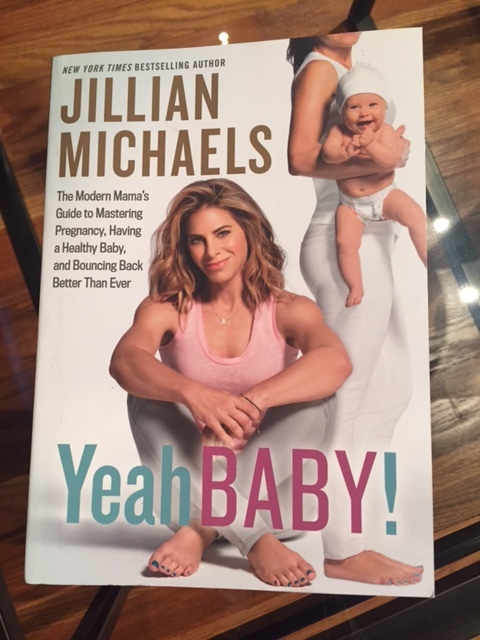 While everything Jillian shares makes sense, I often felt like I wasn’t being a good mommy-to-be because of her super high standards. For example, my make-up products aren’t all chemical free. But I’m trying my best. Is that good enough? I sure hope so! To implement every single one of her suggestions, you need a lot of money. Period. It’s not easy for the average, every day women to buy all organic everything. That’s the honest truth. I truly believe we all try our best, but even then, some things are out of reach. Again, the meal plan at the end of the book is not for the every day woman. So many strange ingredients. And this coming from someone who buys said strange ingredients regularly. Overall, I found this book to be comprehensive and the perfect one stop shop for all of my pregnancy related questions/issues. Of course, I always check everything with my doctor, but it’s been nice to have a reference guide at home that’s written for the modern momma. My most used books were Baby Bargains (get newest edition from the library for use in creating your registry) which reviews the best baby products, and eat sleep poop for a reference once baby is born, but don’t read the chapter on medical issues as it’s not really meant to be read but can be referred back to if needed. I share the same sentiment about Jillian. Her stuff totally made me shed and shred before my wedding, but, some of her nuances just annoy me. I’m glad the book was helpful for some things!! And can we take a moment to talk about how I hope I can see you this weekend?! Will text you when I get a sense of timings of e’erthang! YES!! Can’t wait 🙂 Text me your plans! The fourth trimester is no joke! I wish I had read more about newborn sleep schedules and what to expect. It’s on my list of things to do! Everyone keeps telling me every baby is different, which I totally understand, but I too think it’s good to be somewhat informed at the very least! Thanks for the push! Not pregnant or close to it, but I think this would be a great gift for someone who is pregnant. thanks for the honest review. And congratulations!